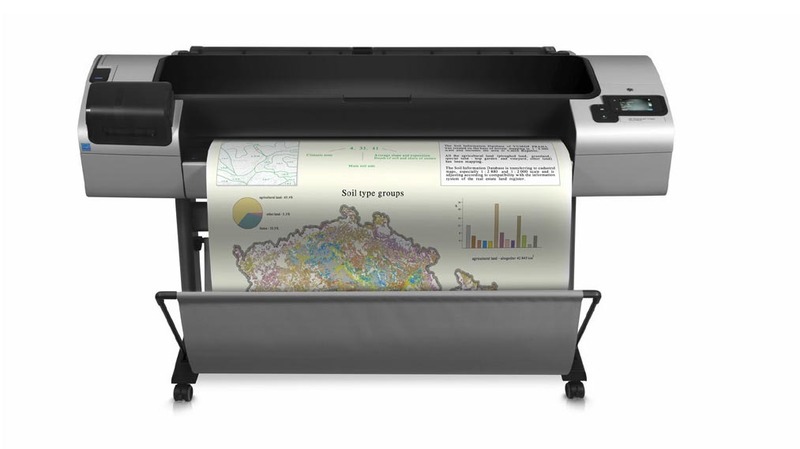 The dual-roll HP DesignJet T1300 helps you get more done faster by allowing you to print on different paper types and sizes without manual switching. Print a range of CAD and GIS applications, including large infrastructure projects and geospatial mapping. • Six Original HP inks produce a wide color gamut ideal for color graphics. • Original HP gray and photo black inks achieve precise line accuracy, dark blacks, and true neutral grays. • Make your architectural prints shine with professional, high-resolution graphics— with Adobe PostScript®. • Communicate with precision—produce plans, drawings, and maps with fine line quality, and up to 2400 dpi. • Print on different paper types and sizes seamlessly—and save time—using two rolls with smart switching. • Job center—manage job queues and job storage, track print costs. • Print TIFF, JPEG, and PDF1 files from your printer’s USB thumb drive—no computer required. • Gain flexibility to print a range of sizes from sheets to 44-inch (1118-mm) roll width. • Use different media—this printer supports everything from bond and coated papers to film and vinyl substrates. • Print a range of CAD and GIS applications, including large infrastructure projects and geospatial mapping.